Just before Labor Day, I took my Boston sister, Anne, to my favorite place to while away some time in the Northwoods. In fact, Chucky Lou’s Last Dance is the inspiration for the title of my blog. It may be the last big tourist weekend of the summer, but unlike the malls and city shops, the proprietors in our out of the way places operate on their own time. Though disappointed to find the Closed for the Season sign, I like the fact that there is an independent spirit about the shop as well as unexpected treasures within. 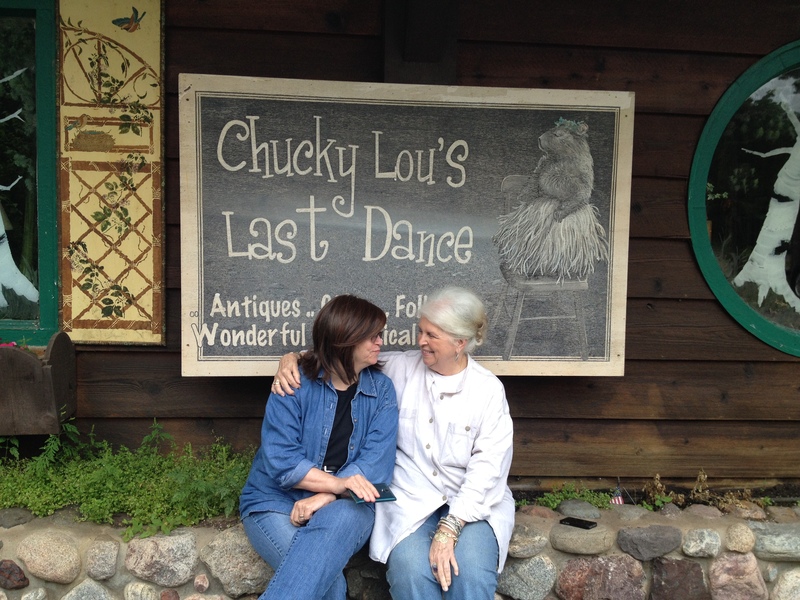 This entry was posted in Uncategorized and tagged Chucky Lou's, Northwoods, Sisters, Summer. Bookmark the permalink. Sisters, a drive during a spectacular season, sharing a favorite place, and, upon discovering that place is closed, posing for a photograph that illustrates the bond sisters share. It doesn’t get much better than that. Next summer, I look forward to all of us being together at the cabin.